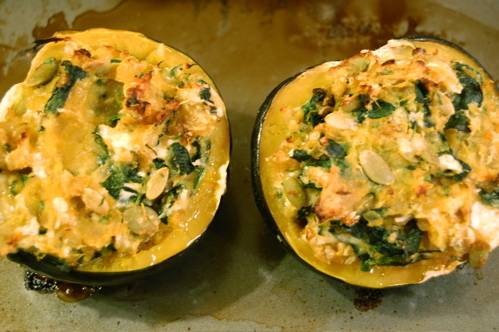 I was inspired to buy an acorn squash at the supermarket a few days ago, after seeing a baked stuffed one on the menu in a restaurant. It should be noted here that neither Mr Weiss or I ordered it, but I at least thought I’d take a crack at cooking one myself. This ended up being the classic case of whatever we had left in the fridge was going to be the stuffing, so feel free to do the same when foraging at the bottom of your cold box for scraps! 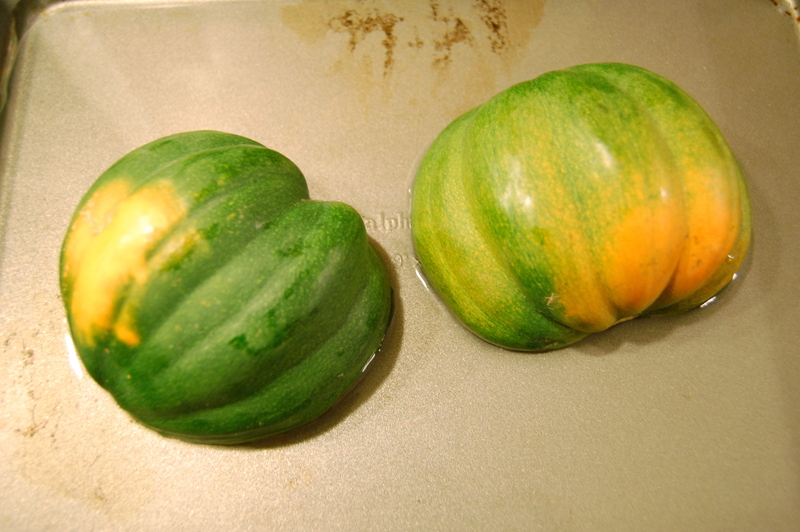 Place squash cut side down on rimmed baking sheet, add water to make about an inch up sides of pan. Bake 350 for 30 mins. 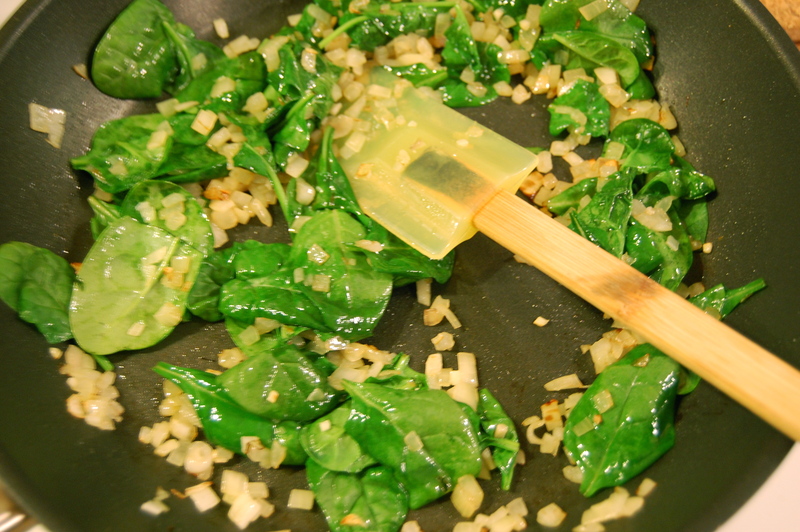 Saute onion and garlic in 1 tbsp olive oil until golden brown, add spinach, wilt. 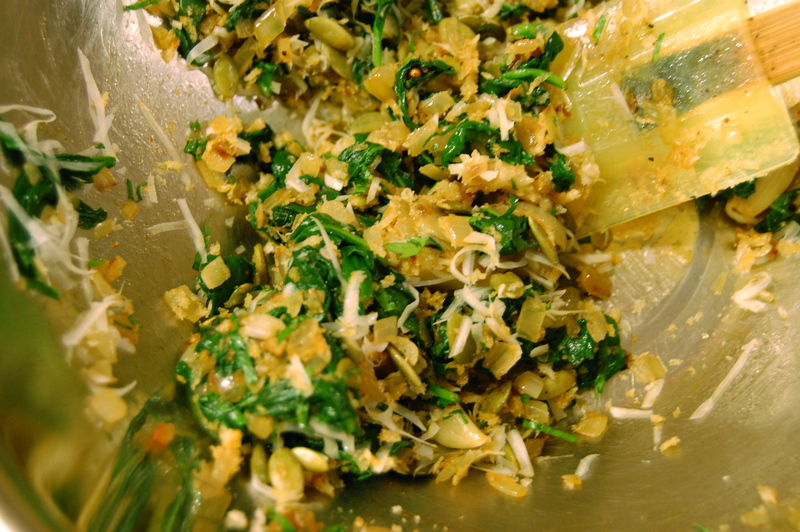 Remove from skillet to bowl add the rest of the ingredients and stir. 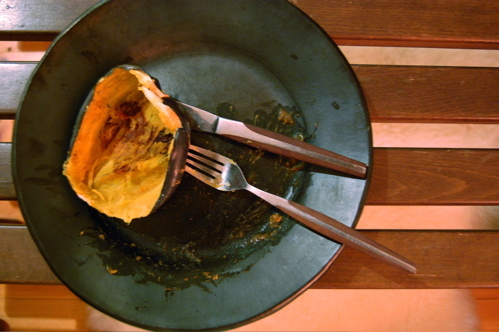 Scoop out flesh from squash, add to bowl, combine ingredients, then spoon back into squash cavity. Place back on baking sheet (without water), bake another 30 mins, until golden on top. 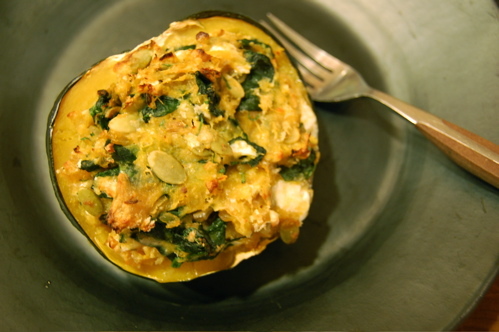 This entry was written by thecatskillkiwi and posted on March 17, 2009 at 1:57 pm and filed under Pictures, Recipes. Bookmark the permalink. Follow any comments here with the RSS feed for this post. Post a comment or leave a trackback: Trackback URL. panko & pepitas? what the hell are they??? go and roast marshmellos after dinner! If you save the squash seeds you can plant them in the spring and put them outside when all danger of frost is gone and you then can maybe grow your own squash.